Yorkshire pudding is an English food made from batter consisting of eggs, flour, and milk or water. It is often served with beef and gravy and is part of the traditional Sunday roast.So the other night, I was watching Mary Berry’s on BBC Lifestyle and she was making Yorkshire pudding. I have heard and seen that name so many times, that I convinced myself it was part of a pudding. I saw it being made on The Great British Bake off, and they made it seem so easy, so I knew that I just had to try it out and I did. One late night, when the world was asleep and I was wide awake I tried it out. The recipe seemed a bit scary in the beginning, because they kept saying the oil has to be hot and then my health and safety training kept freaking me out, because what happens if the oil gets too hot and catches alight in the oven and so on and so on, I seriously have a wild imagination. As my mother would say as she reads this, a little bit of knowledge is a dagger in one’s own heart. Pour some oil in a each hole of your muffin pan. While the pan is heating up in the oven, make the batter. In a bowl, mix the cake flour and salt together. Add one egg at a time and whisk between each egg. Add a little milk at a time and whisk until smooth. Pour the patter into a measuring jug, this helps when pouring the batter into the pans. When the oil in the muffin pan is hot enough roughly 10 minutes in the oven. Careful pour batter into the muffin pans, fill each muffin hole till about ¾ full. When you pour the batter into the oil, there must be a sizzle, this is important, if there is no sizzle, the oil is not hot enough. Pop back into the oven and bake at 180C for 20 – 25 minutes, or until nicely puffed up and golden brown. 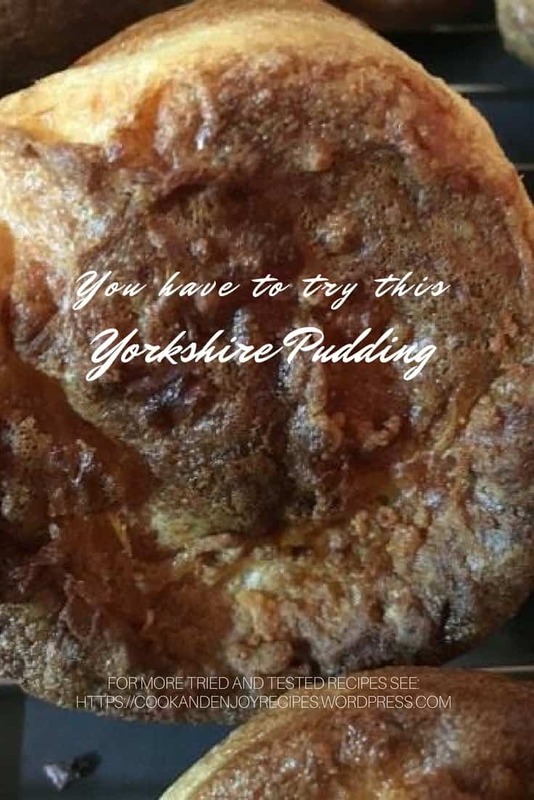 I do and often but funnily enough I bow to my stepson who is American as the maestro of Yorkshires … he set about teaching himself as a teenager after visiting with my husband’s family in the North of England and declared the ‘Yorkie’ the finest thing he had ever eaten!!! Oh wow – awesome – chef in training !! He is very resistant of the idea but I know he would be a shoe-fit! Oh wow that will be just beyond awesome. Please keep me posted.